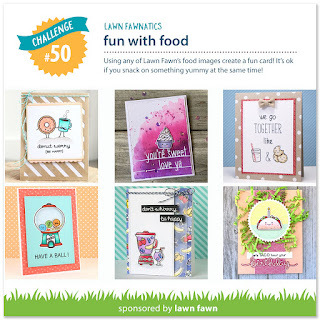 Hey everyone, here with an entry for the Lawn Fawnatics 50th challenge! I love all of the fun food sets that Lawn Fawn comes out with but this little S'more is by far my favorite. S'mores are some of my favorite summertime foods. They remind me of all the fun times I spent camping. **And I realize now I must have been channeling Jessica because I even used the same sentiment. Great minds and all that!! I made a simple distress oxide ink blended background. I combined twisted citron with mermaid lagoon. I splattered the background with more of the same colors along with some copic opaque white. I die cut using a Lawn Fawn stitched circle. I curved a sentiment to go around the outside of the circle and stamped it in Lawn Fawn's Jet Black ink. The S'mores are copic colored in various shades of brown. The crackers are in e30s, the marshmallows are e50's and the chocolate is e20's. I used a tiny enamle heart from Doodlebug. © Sharna Waksmulski 2013. All rights reserved. No stealing. Powered by Blogger. All content on this site is © Sharna Waksmulski. Please respect my work & designs and use only for inspiration!